A lovely Jules David plate with two fashionable ladies and a boy and his bicycle. The unusual outfit worn by this boy was designed so that he could ride his two wheeled bike more easily. Fashion plates were produced as early as the 18th Century but became particularly popular during the nineteenth century, mainly due to advances in technology. The word ‘plates’ originates from the technology used in the early days of printing where flat metal plates – or pieces – were etched with a design; these were then inked and could be printed from over and over again. The plates were printed in linear form only, then coloured by hand. There were a few distinguished artists who designed the illustrations, including Jules David, who always signed his work. The illustrators were superb artists and were truly the first “fashion illustrators”. The fashion plates were inserted into contemporary magazines of the time, with usually just one or two plates per issue, as a way of advertising the latest fashions to their readers. 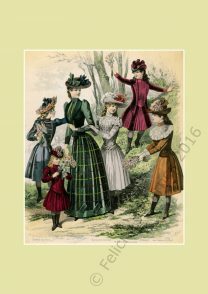 These early fashion magazines were only available to the middle and upper classes – those who could afford to buy them, and perhaps have the outfits made. By the end of the nineteenth century, technology had advanced so much that there was no longer any need to design and produce the fashion plates by the original methods. 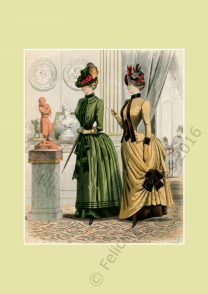 To this day they are invaluable as a resource in researching the history of costume and fashion illustration. 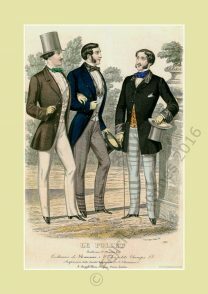 These A4 sized prints have been produced from original, hand-coloured fashion plates. They are high quality Giclée prints, made using fade-resistant inks. 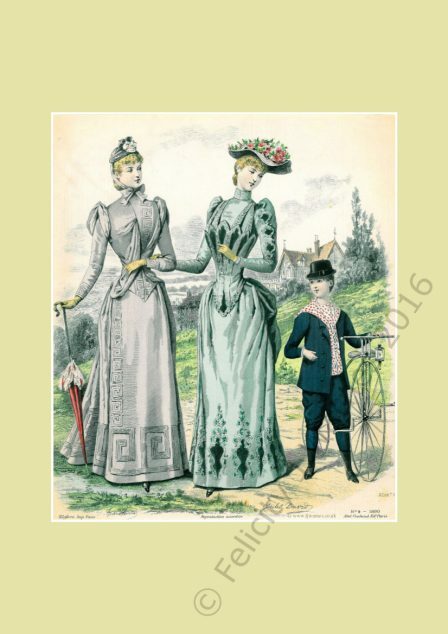 Many of these images can be found in the book Nineteenth Century Women’s Fashion, by Felicity J Warnes.